Thursday I took a trip with the kids to play and have dinner with our Bouf cousins (or as Katie calls them her "9 cousins" as opposed to my sister's kids who she calles her "3 cousins." 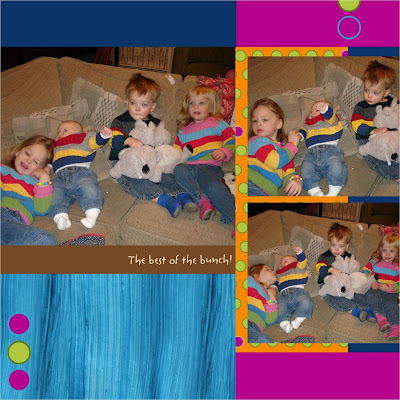 Debi wrote all about the fantastic time we had trying to get pictures of the Katie, Timmy, Emma and Will in their matching sweaters here. I think I was sweating by the time we gave up. She pretty much covered the entire fun experience, but here are just a few more pics of the fun day. We were excited to see Katie and Emma actually really playing together for the first time. 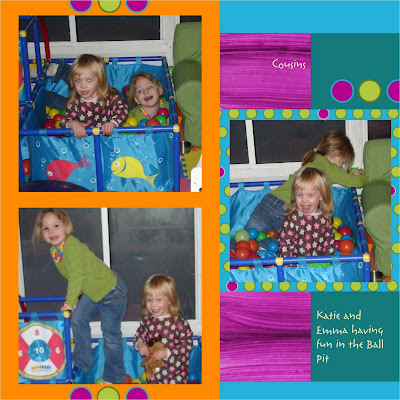 They had a great time playing in the ball pit together before dinner. 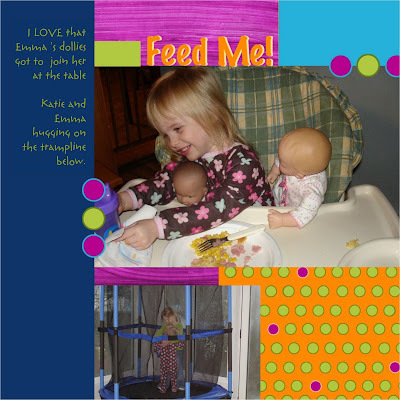 Emma cracked me up at dinner, sitting with her dollies. The girls also had fun jumping on the new trampoline that Emma and Will got for Christmas. In the pic below, they are hugging in response to me asking them to hug and let me take their picture...I kind of meant to face me, but I guess you can't have everything. I love these pictures below, especially because of the interaction I see with Will and the girls. Up top Will is just laughing away and Katie is also laughing just because he's being so silly. On the bottom right, Will actually looks like he's laughing at the girls being silly and on the bottom left, it we have some Rockettes in training. And finally a few decent pics of them together. As usual, we had a blast! We love our playdates with our cousins. We can't wait to see them tomorrow at our house! 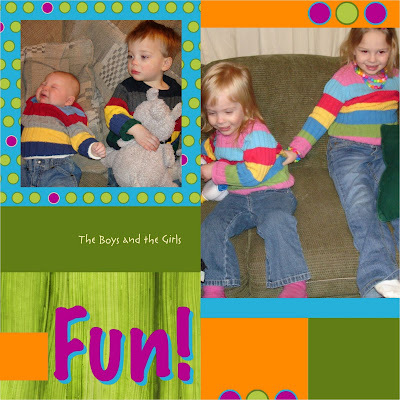 Looks like great fun, cousins are the best! I'm glad yall are so close to your family. It's so nice to see family's close. I bet the kids adore each other. My son is very close to his cousin Aiden and they adore each other. Will is a big boy! My Andrew was big. He weighed 9lbs 7oz when he was born. How much did Will weigh? He doesn't look chunky by any means. He looks long. We are on our way out to eat dinner with family.Have a great day and Happy Monday!! Tim was 8lbs 9 oz at birth and 21 3/4 inches. At 2 months, he's 14 lbs and 24 1/2 inches.